As I wrote before, my second daughter Yuri and I are visiting Germany for the first time in autumn. If I'm rich enough, I will buy the air tickets right before departure, but I'm not. I had to get the discount tickets far ahead of the flight and I bought them today. Though I have visited Canada every two years in the past ten years, every detail of the trip was done by my friend, who is teaching English in a college in Kobe. She was remarkably talented and when she took charge everything was perfect. However, this time, I had to do it all myself. I asked a travel agent, HIS, to get our air tickets this time because I've used this agent when my family traveled in Alberta and British Columbia in Canada in 1995 and they did their job admirably. 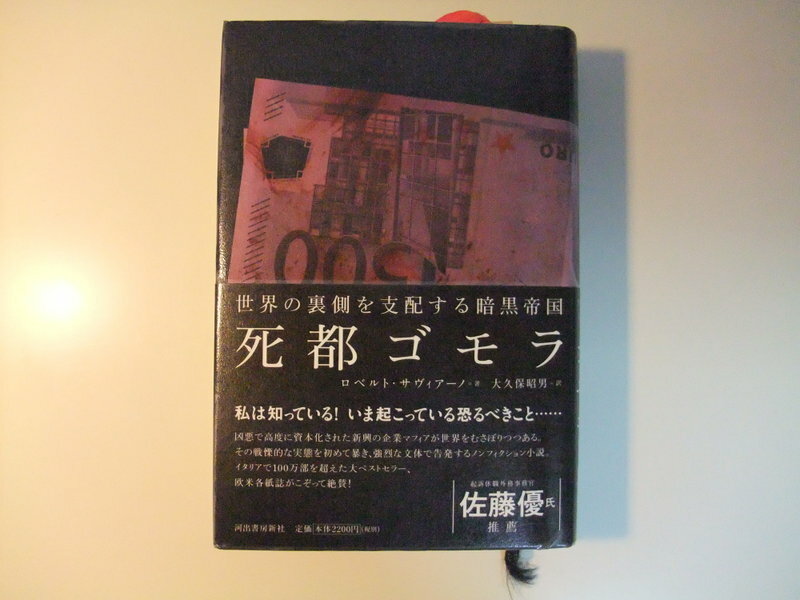 I sent a lot of money from my bank to the agent and received air tickets and documents for various procedures at that time. The thickness of all the tickets and documents was irritating. To my surprise this time I sent the tickets' fee on the internet from my desk and received tickets via an e-mail! 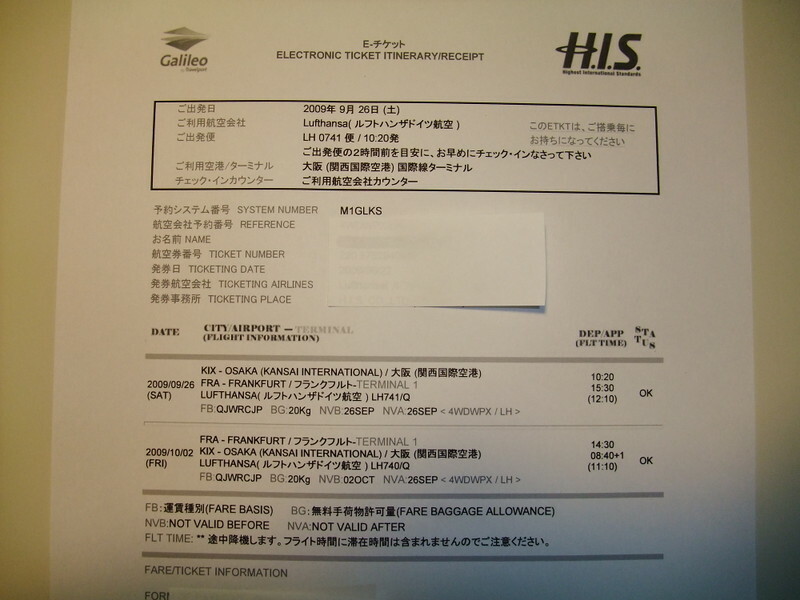 The air ticket is called an e-ticket and was added to the e-mail. I have only to print them out and take them to the counter of the air company with our passports. I'm planning to visit Freiburg in Germany this autumn. I accessed the website of Freiburg City and got information for tourists. 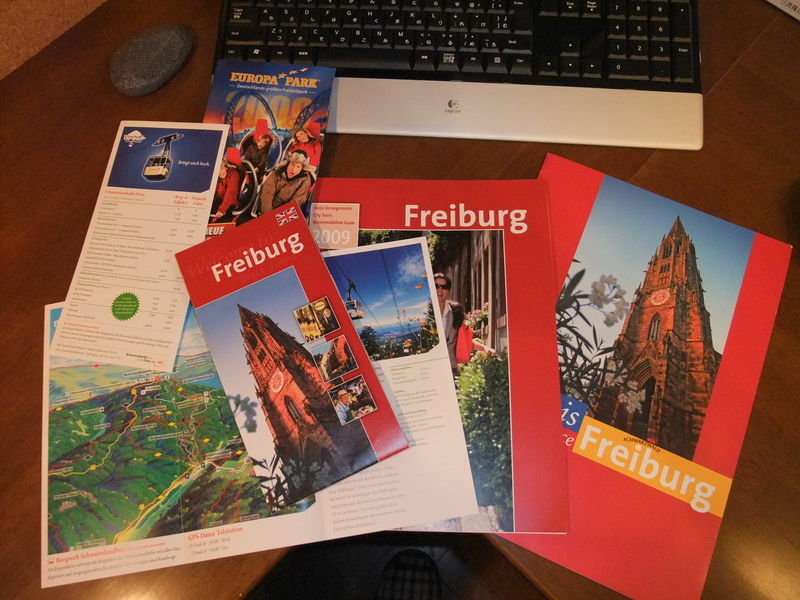 They sent me lots of pamphlets about Freiburg and around the city. I'm showing you them. I'm scouring these pamphlets now. I'm kind of a nerd. I have a great attention to detail and have to have everything perfect. I found that Freiburg was located ideally. I mean, the city is very convenient for sightseeing. I'm going to wander Basel in Switzerland, Strasbourg in France and around Lake Constance (Bodensee in German). Basel is on the border of Switzerland, Germany and France. Lake Constance is likewise the border of Germany, Switzerland and Austria. I will take a billion pictures and I was afraid that I wouldn't know where each picture was taken, so I bought a GPS Logger, which shows me where I was at any time later. It links pictures and places where the picture was taken by reconciling the time that the picture was shot. 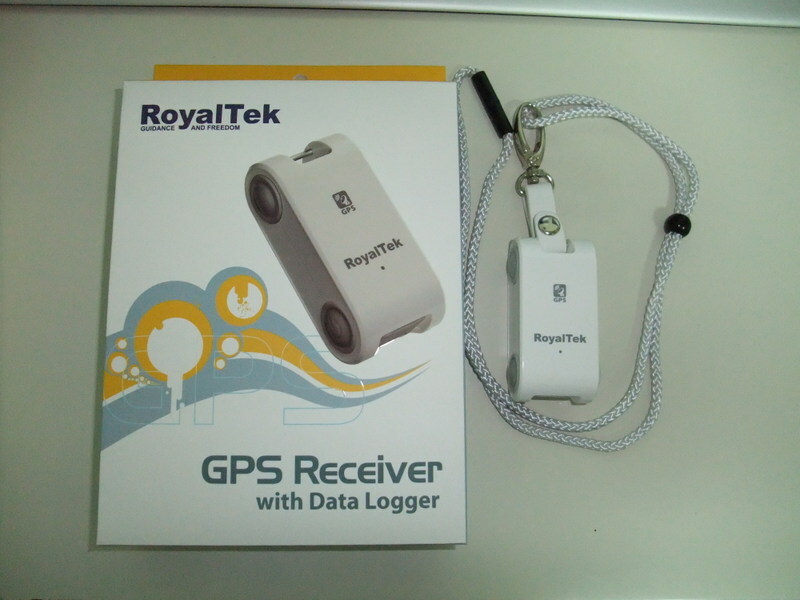 The second picture is of the GPS Logger. This device can record where I am every second for a continuous seven days. Can you believe it? I've only to put both pictures and my log into my PC and the PC makes up my album automatically. I'm sure that it will be open to the public in this blog. Many politicians insist that Japan has to admit immigrants and give them suffrage. I think it is a stupid idea. I'm showing my opinion this time both in English and Japanese. I'd be happy if you send me your comments. A birth rate of at least 2.11 seems to be essential in order for the culture of a country to be preserved. Let's check the rates of 2007 in European countries. Don't you think it is critical? However, the population of EU hasn't been decreasing. Why? It's because those countries admit lots of immigrants. Ninety percent of the increase of European population since 1990 is due to the immigration of Muslims. Birth rate is 1.8 and that of Muslim is 8.1 ! If simply calculated, one of every five French will be a Muslim in 2027. After 39 years (in 2048), more than 50% of people will be Muslim and France will be Muslim country. The number of Muslims will increase from 82000 to 2.5 million in 30 years. At present, 50 % of newly born babies are already Muslim. 15 years later, Holland will be a Muslim country. The number of Muslim is 23 million right now. That is one fifth of its population. Twenty five percent of the population is already Muslim and 50 % of newborns are Muslim. It will be Muslim country in 2050. According to the German Government, there are 52 million Muslims in Europe and it will increase to 140 million in 20 years. Birth rate is 1.6 and the population has increased by 1.6 million from 2001 to 2006, but 1.2 million is the increase of immigrants. The number of Muslim in the U.S. in 1970 was only 100,000 but increased to 9 million in 2008. It is supposed to go up to 50 million after 30 years. What do you think about this status? You figure out how critical the situation of the Europe is. You might suspect if the Muslim religion is bad or not. I'd like to express my opinion about that below. To quickly describe what I wrote above, the Muslim culture is gradually and legally encroaching on the Christian culture sphere and the situation is supposed to be irreversible at present. It's because of the difference in the birth rate between Muslim people and people in western developed countries. Several decades from now, Muslim people will dominate the world and other people will have to get along as minorities. I came up with a fearful idea. When the population of Muslims becomes more than a half the world' population and Muslim people obey a certain spiritual leader, can we not say that Muslim people will become the supranational group? Their own rules will rank over the constitution of the countries that they actually belong to. They might ruin the concept of the nation. They might break down other peoples' culture. Is there any means to prevent Europe from muslimizing? It's a very easy task. You should not allow Muslims to immigrate into Europe. The rate of unemployment in EU is 9%! Why do they accept immigrants? I can think of two reasons. Secondly, EU are planning to increase their population and their influence, and eventually deprive the U.S. of hegemony. The other day, moral-lacking Sarközy was talking in front of a camera that EU should build up a single economic sphere with Turkey and Russia. I was surprised to hear that. Turkey shares the issue of "Lie of Armenia" with France and "Cyprus Issue" with Greece. Turkey will never be a member of EU, at least in near future. Russia is strongly putting up a fight against Georgia and Ukraine about their joining NATO. His idea makes no sense at present. Besides, if this single economic sphere brought on the free immigration of labor, western Europe would be inundated with numerous Islamic immigrants. People living in southern Russia are mostly Muslim. They will move to Europe via Turkey, because their income will become ten or twenty times much more just only to move. Eventually free immigration will result in the disappearance of the original civilization. "President! Aegean civilization was destroyed by the great migration of Dorians." "The Roman Empire disappeared due to the great movement of Germanic peoples." "Do you know that European civilization will be wiped out by the influx of Islamic people?" By the way, is Japan OK? I think Japan can be free from this, if people are sober. Do I hate Muslim? No, absolutely no. I never look down on Muslim people. Actially, is this sharp rise of the Islamic population a threat to Japan? Though some Asian countries are Muslim; Indonesia, Malaysia, Pakistan, Central Asian countries, fortunately they aren't hostile. These countries would never be hostile to Japan. Japan has the advantage in the sense of geography. Immigrants flow from poor countries to rich ones all the time and they prefer land borders rather than ocean borders. Poor Islamic people would rush to rich western Europe at first. Then they will destroy the European Christian Civilization. Naturally, it is this story that will foillow after more than fifty years. What's the choice of Japan? Japan must not accept poor immigrants from Islamic countries. Why do immigrants provoke riots in France? It's because the French have the sense of discrimination that make Islamic people do the work that the original French hate. It's the best way not to accept those people in order to foster enemies inside. For the record, equal footing is OK; athletes, actors, university professors, engineers, business persons, doctors,,, and so on are no problem. Once specific poor classes are formed, it leads to an unstable society. Security will be compromised. It should be emphasized that the real enemy is not the poor immigrants but the politicians who push forth the discriminatory policy that failed in Europe. I'd like you not to vote for such politicians in the coming election. 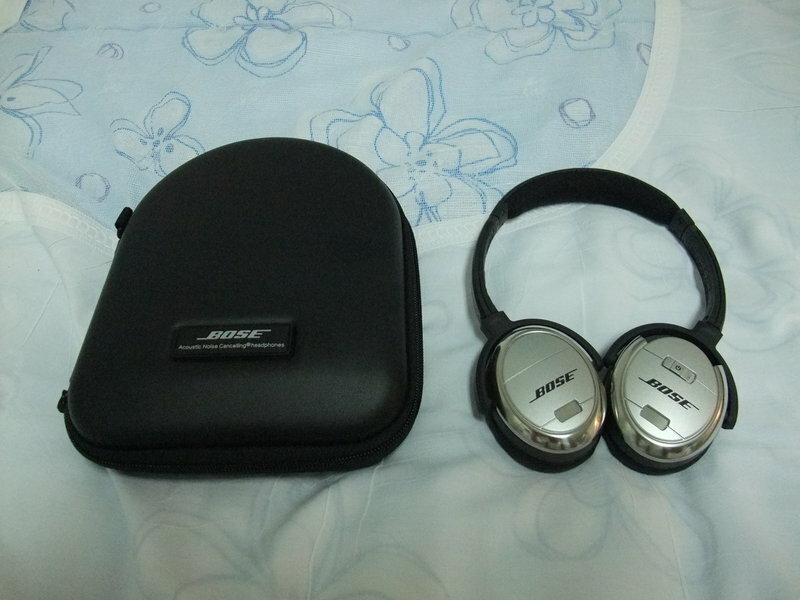 Finally I bought BOSE QuietComfort 3 today. I wrote about these noise canceling headphones in the following entries. I've been eager to get them for the last two years, but they were expensive. I was expecting that the price would become lower someday, but the price has been kept the same. No discount for two years. When I saw the article about the campaign on the internet, I gave up waiting for the discount. The manufacturer said, "If you buy it now, you'll get a backup battery for free." This was what made me decide to buy it. I made up my mind to visit a German small city of Freiburg this fall. I got the permission of my boss and bought some books about Europe today. 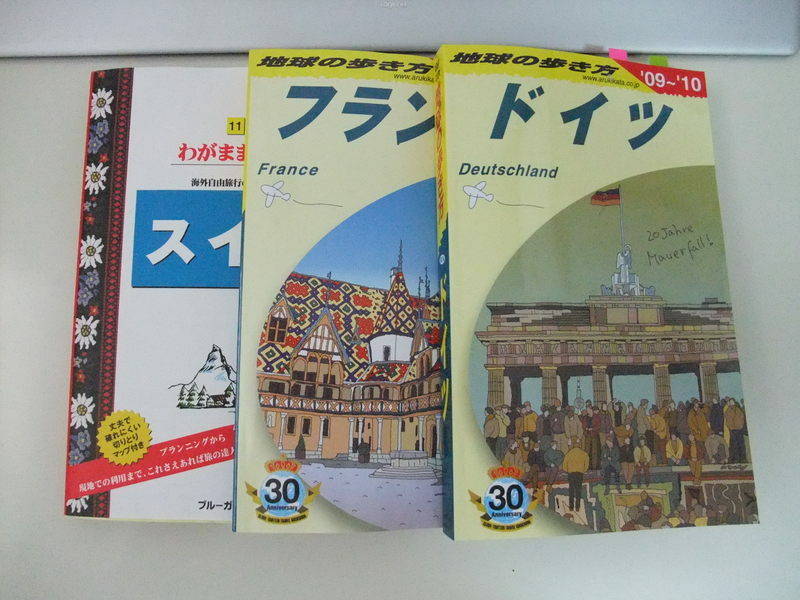 I'll show you the books below; it says on each cover, Switzerland, France and Germany in Japanese. Freiburg lies near the border to Switzerland and France. I'm going to pass over the border and step into Basel and Strasbourg. Basel seems to be in the German-speaking sphere and my second daughter is helpful because she can speak German. I'd like to take my eldest daughter too, but her schedule is uncertain now. If she could come with us, she is also helpful because she's a good French speaker. Anyway, I'm thinking that I should study the modern history of those countries and it will make our trip more enjoyable. 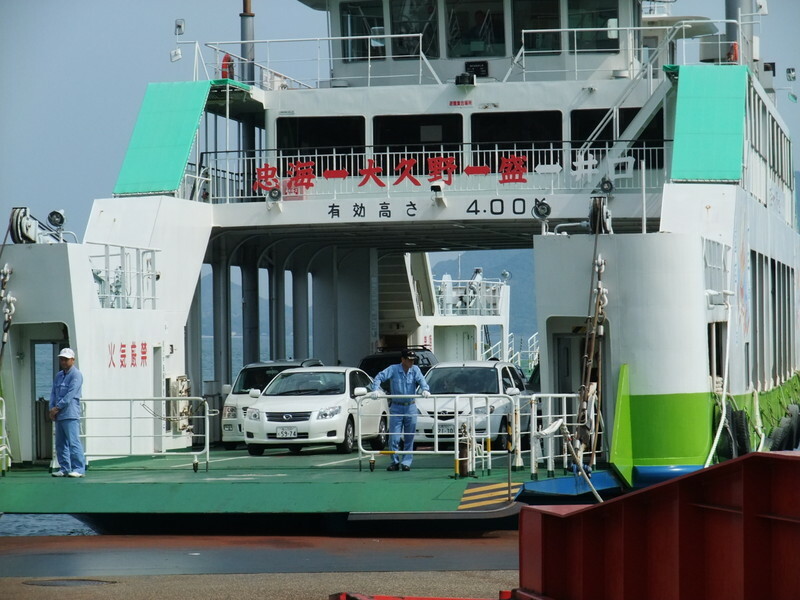 The ferry boat passed near Okunoshima Island shortly after the departure and I took a picture. This island had been erased on the map during the war and only a very small number of people could have been allowed to get onto the island until recent years. The whole island had been a factory, where chemists did research of toxic gas and some kinds of toxic gas had been produced. I'm thinking to visit the island some day. There are ruins of factories and the research center, and some of the ruins became tourist attractions. After the eight rabbits were released a few decades ago, the number of rabbits increased. This island is also called the island of rabbits. 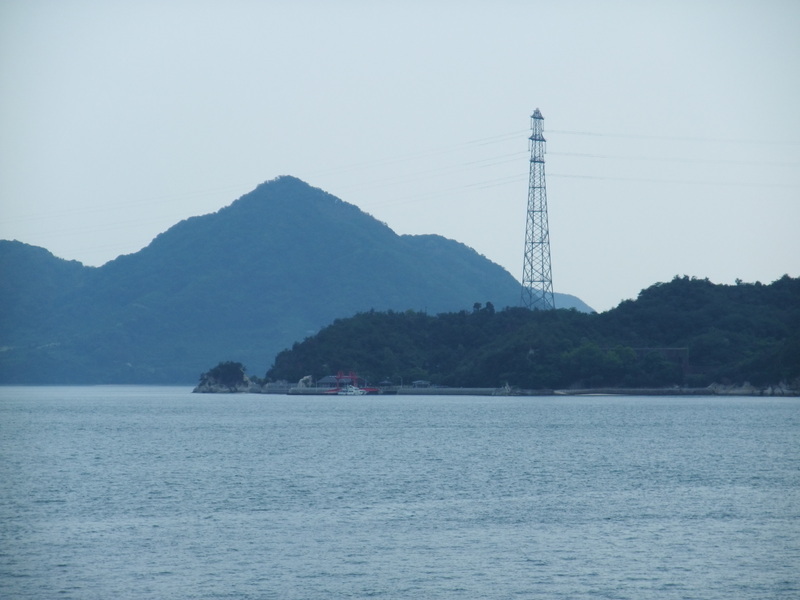 After getting out of the submarine, we headed for Tadanoumi, where we got on a ferry. The return route is drawn in green on the map. http://kumo.typepad.jp/wadachi/tobishima.html It was sunny one minute and it was a little bit rainy the next, but we were lucky that we didn't need to wear the rain suits. 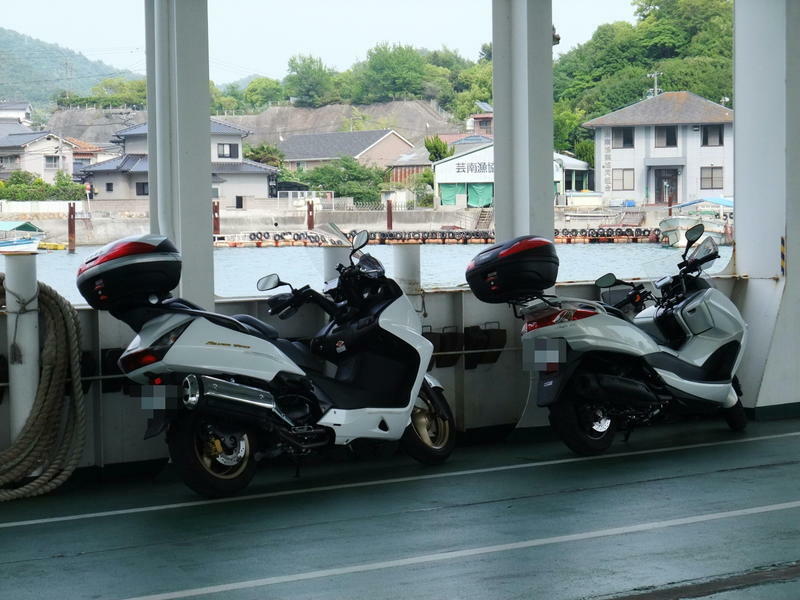 The first picture was of our scooters', just waiting for the ferry. The second is the ferry that we were aboard. The last is our scooters in the ferry. It was the first time I was able to see a submarine this closely. It was bigger than I had expected. 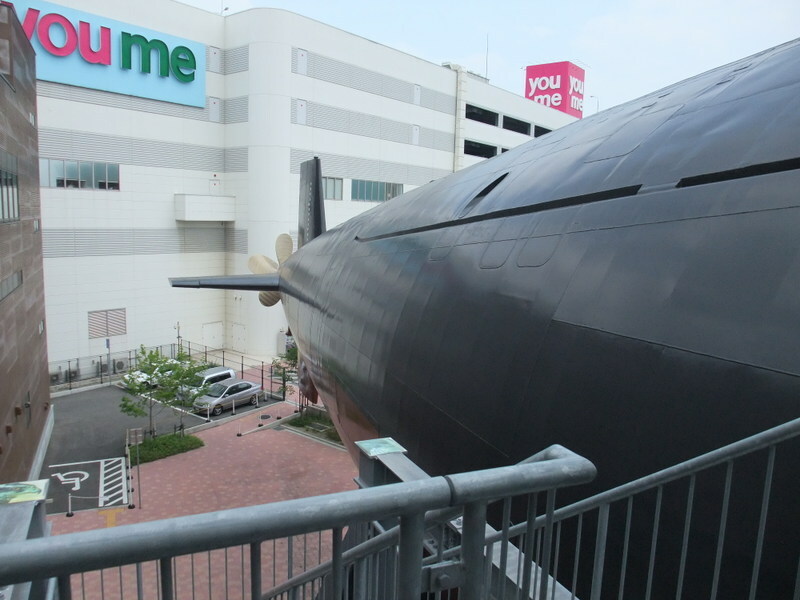 This submarine had been on duty up until 5 years ago and now is exhibited for everyone. I think that the submarines are classified material themselves. The exhibition of such stuff was amazing to me, but what they don't want to be open would be hidden or removed from the submarine. 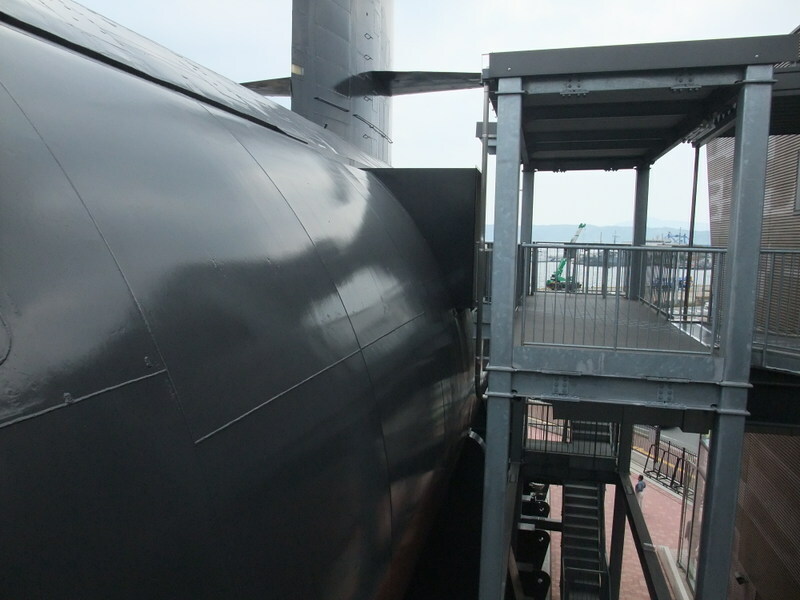 Inside the submarine was unbelievably cramped. The crew's beds were so narrow and were arranged vertically just like shelves or racks in the bookstore. When a man lie on the bed, the space above him would be as small as 30cm. I've seen a bed of the crew on a destroyer before and it was small. However, a submarine's crew's bed was smaller or tinier than that of a destroyer. They have to stay in the submarine many days without seeing outside. I would never put up with such a condition. Not only the beds, but all other space was used efficiently. I wondered how hard the crew's lives were in the submarine. I'd like to thank and respect the JMSDF members for enduring this harsh condition. At last, I tried to look into the periscope. The view through the scope was clear. 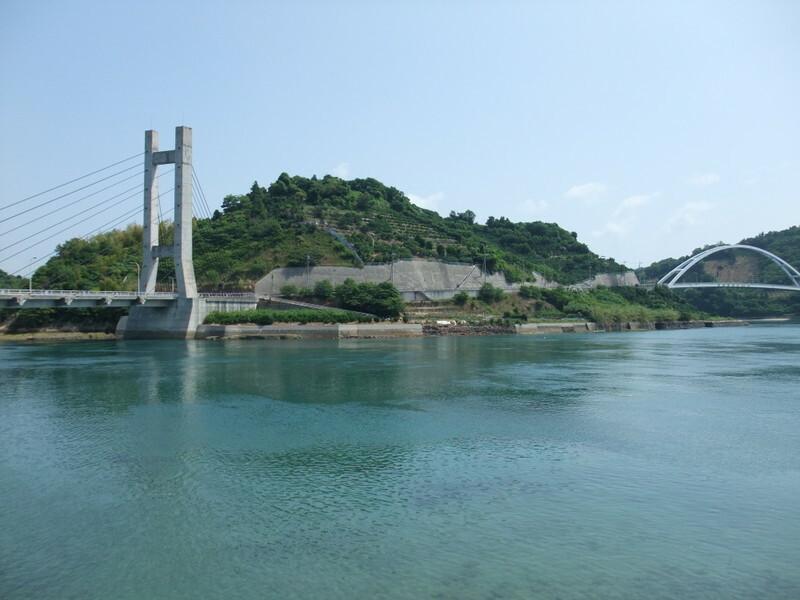 We got to Oosaki-shimojima island, passing over three bridges from Okamurajima island, just like a grasshopper jumps between islands. 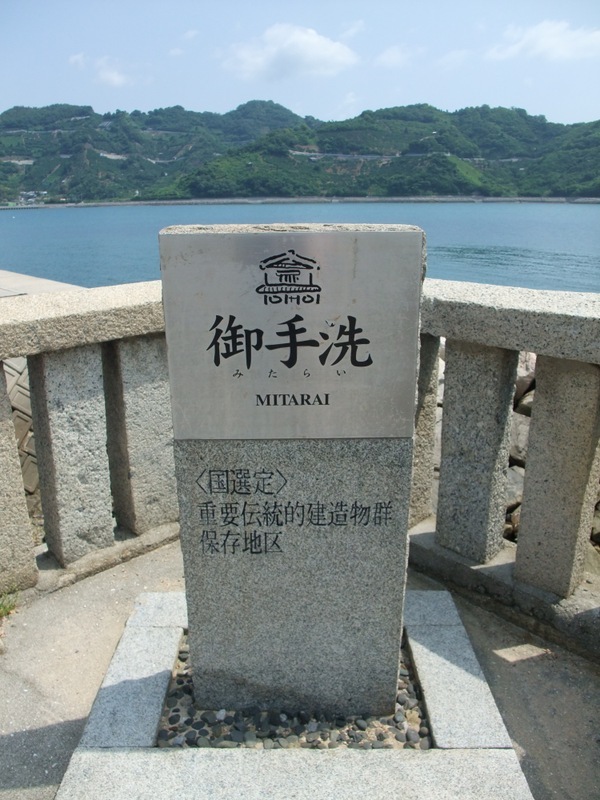 The direction for Kure City was right, but we turned left and dropped in at the Mitarai Area. It's because this district was a historic place. I was ashamed for not knowing this place. This site was very small and tiny on a trivial island, but the location had been ideal for mariners for a long time. When a fierce storm passes, the inside of this area was secure. I think you can imagine that from the first picture. 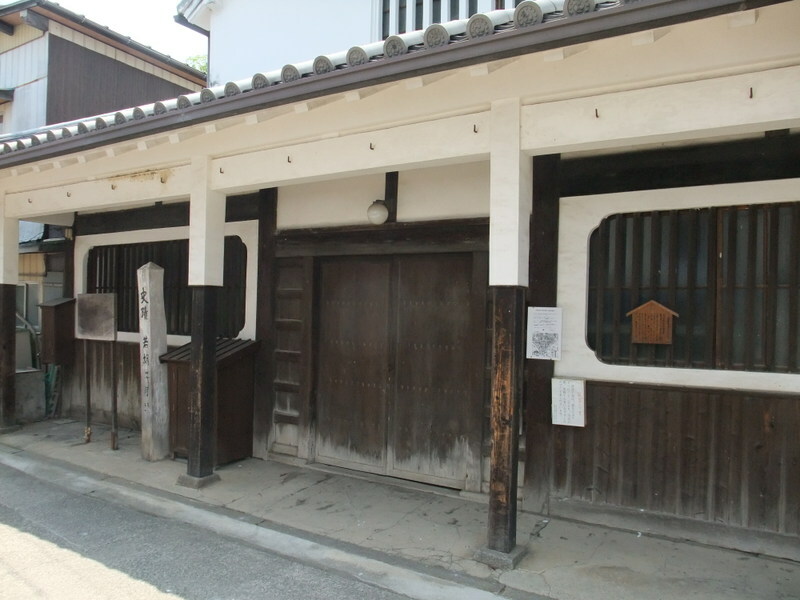 So, Korean envoies had used this place as a stopping point on the way to Edo (former Tokyo in 1600-1868). There remains some Korea-related stuff here. The second picture is of the light house that was built in the 17th century. The monument in the third picture says that the whole area is a national preserved area. Naturally, there was a licensed quarter and more than 100 prostitutes for mariners or travelers. The fourth picture is of the biggest house of profession, which was closed from the damage. The posts and beams seemed to be distorted and need to be repaired. Besides, there were so many nostalgic artifacts for Japanese, and that stuff would be fun for foreigners. 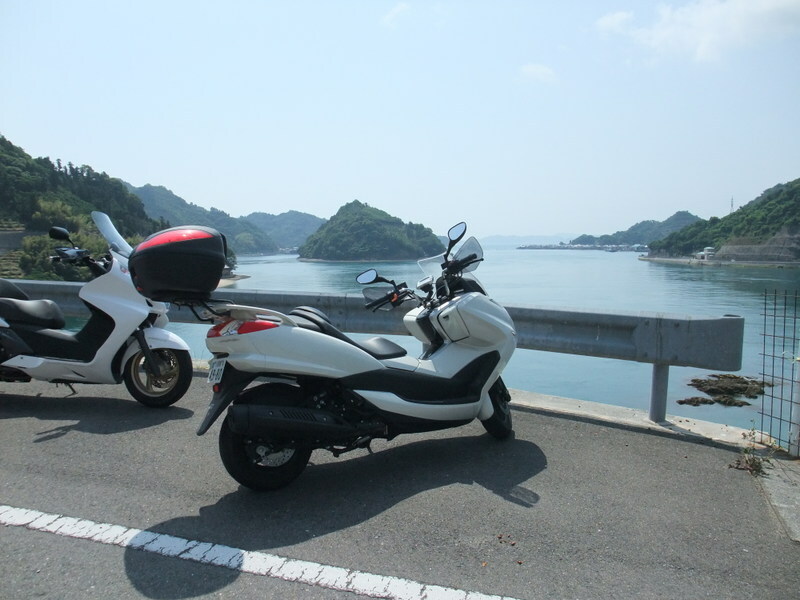 Last Sunday, I enjoyed riding my scooter along the Tobishima Route as I wrote in the last entry. I'd like to show you the whole route on the map and pictures in this entry. I have been learning how to use one of the services of Google Map these days and have got it, roughly. I adopted this service in my blog. Firstly, check the following URL: http://kumo.typepad.jp/wadachi/tobishima.html. It was to my surprise that this map could be zoomed in and out, and be panned. It implies that you'll know where the area on the map is on the globe. Try to scale up and down the map. You can easily figure out the whole route. The ferry stopped by two tiny harbors before reaching our destination, Okamurajima. 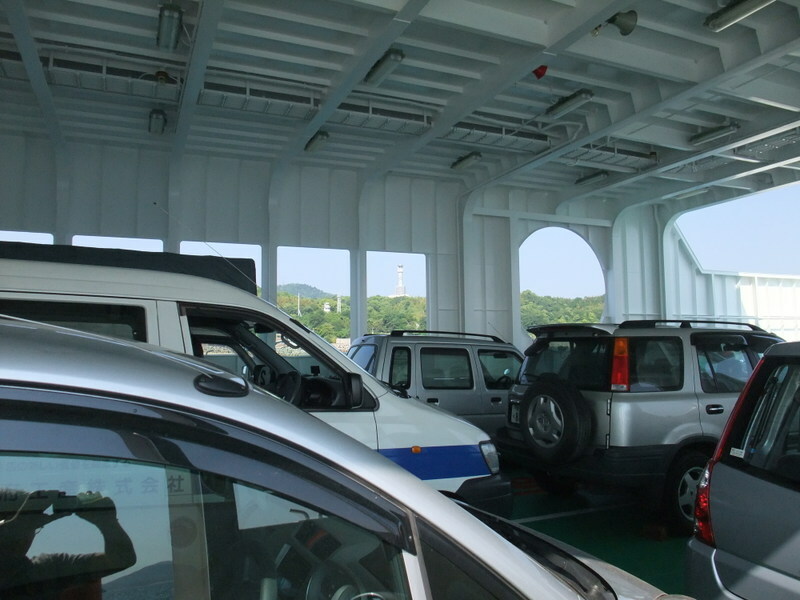 The picture is of the vehicle deck. At first, look at the picture. It looks like an operation seat for something. Can you figure out what it is for? It's a machine for moving! It has no window! Do you see? 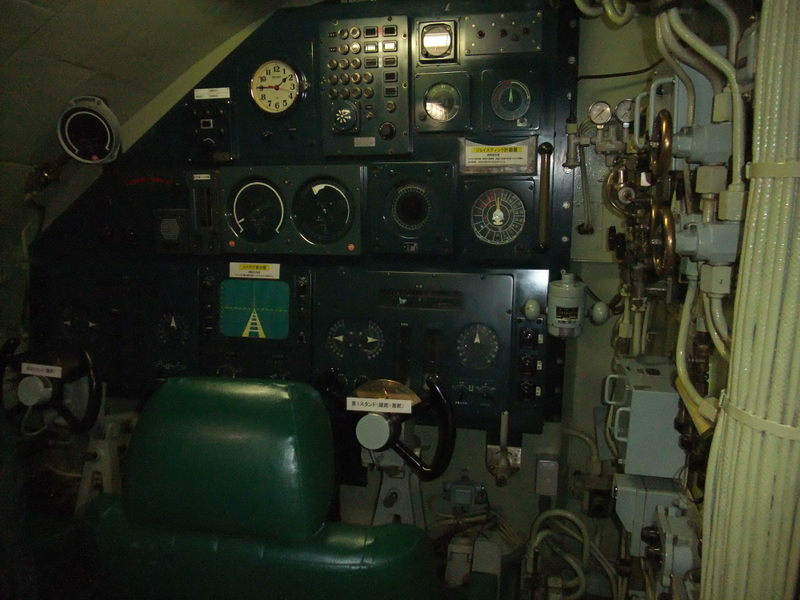 This is the cockpit of a retired submarine which is exhibited at the JMSDF Kure Museum. JMSDF stands for Japan Maritime Self-Defense Force. 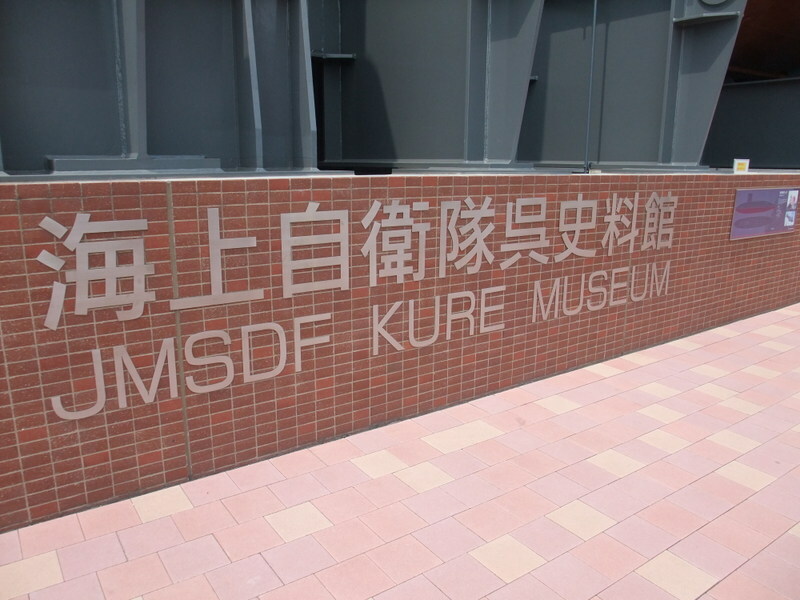 This museum is in Kure City, which is located on the other side of Matsuyama City, across the Seto Inland Sea. As I wrote about Kure City a little bit at the URL: http://kumo.typepad.jp/weblog/2006/08/hiroshima.html, this city is also famous for its military industry. The JMSDF's officer candidate school is also in this city. I could see some other stuff about JMSDF in this museum. 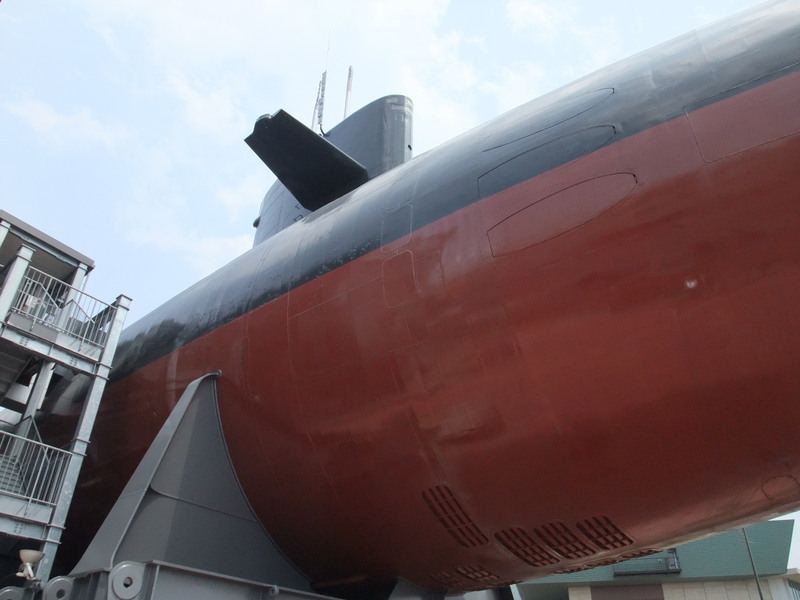 If you want to see this submarine, you can detect it on the Google Earth. Try it out! 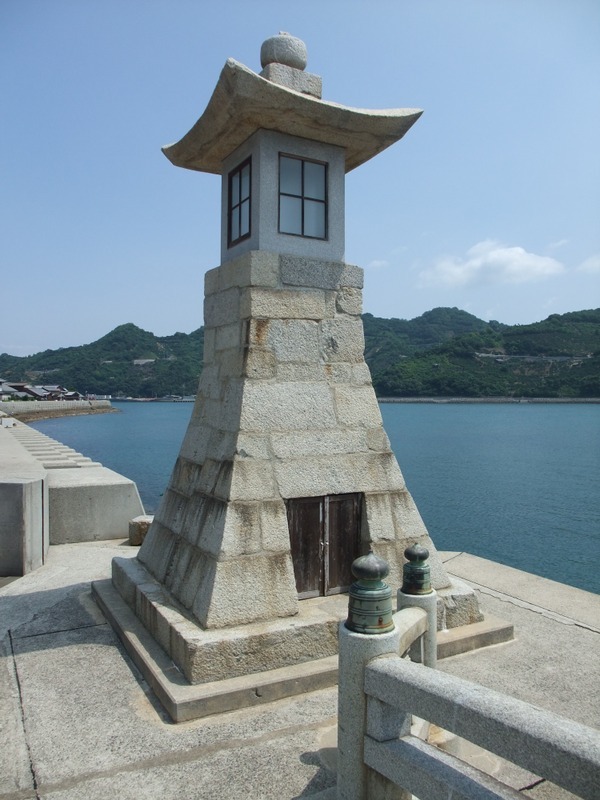 It is near the harbour of Kure City. I went to Kure City last Sunday and I want to show you the location of Kure City and how to get from Matsuyama City to there. 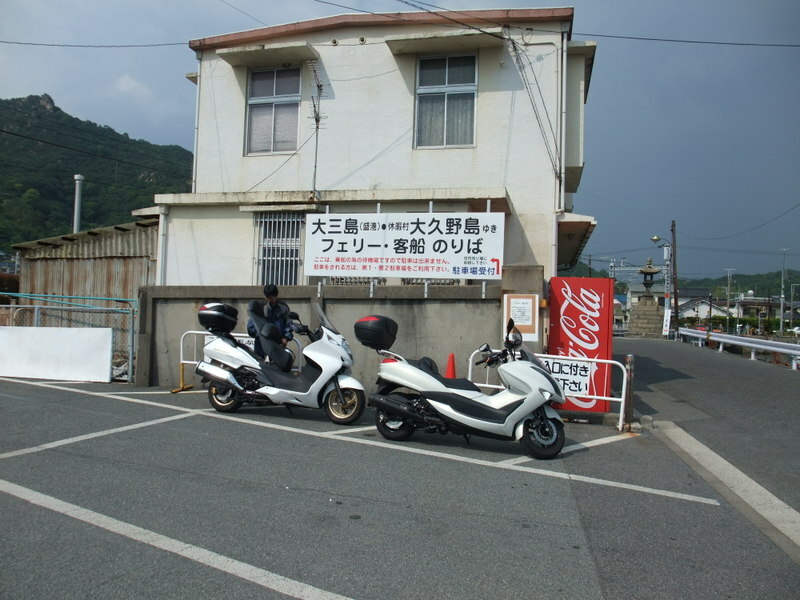 When someone goes to Kure City, he usually uses the Shimanami Highway or some ferry boat. However, I used the Tobishima Route, which is not so popular among people in Matsuyama City, but I heard it was a nice route. Look at the last picture that I took on the route. The surface of water was incredibly calm. It was not a lake, but the sea.